Finishing the Bank of America Chicago Marathon has taken on a whole new meaning for one first-time runner. Seconds after Valerie Bolek’s finish, her boyfriend Jose Rangel was waiting, ready to propose. “I saw him with the medal in his hand and I thought oh ok that’s pretty cool,” Valerie Bolek said. Bolek’s boyfriend said he noticed she looked nervous. "I just said, 'congratulations I’m very proud of you,'" Jose Rangel said. As a first-time marathoner, Bolek didn't know what to expect as she had no idea what would come next. “I had her medal ready and in hand, but I had the box hidden behind the medal,” Rangel said. Rangel dropped to one knee and the caught-on-camera proposal that was months in the making became a different kind of photo finish. Bolek, who is a CPS computer teacher at Volta Elementary School, said she was running to raise money for the nonprofit organization Girls on the Run-Chicago. “Eight years ago, I started running and this was my first race,” Rangel said. Since that first marathon in 2010, Rangel said he’s run the Chicago race two more times since. 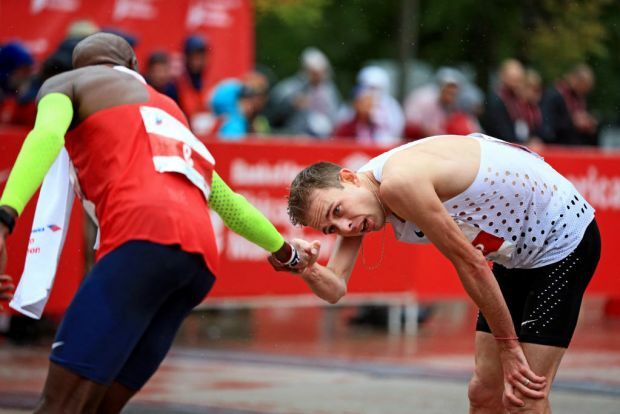 Mo Farah and Galen Rupp may have been battling it out on the pavement in the 2018 Bank of America Chicago Marathon, but the former training partners didn't let the competition get in the way of friendship. This year however, he chose to hold a more supporting role, sporting signs and then popping the question at a milestone moment that now takes on even more meaning. “That was my first marathon and to have her be the first marathon as well … it was good,” he said. Rangel said he learned from friends that the marathon is actually the perfect metaphor for marriage. “It’s long distance, take your time, keep a good pace,” he explained. It's a fairy tale finish to kick off a new beginning for the newly-engaged Chicago couple.